As the 1992 general election approached, Britain was sliding into recession. The electorate were more than ready for change after 13 years of Tory rule, but not entirely convinced by Neil Kinnock’s Labour Party. In the weeks leading up to the election the polls were neck and neck – it looked as though the result could be a hung parliament. On the morning of April 1 the latest opinion poll showed Labour ahead. Labour supporters were over the moon. With only eight days until the election, the scent of victory was in the air. The auspices couldn’t be better for that evening’s Sheffield Arena rally, a gathering of 10,000 Labour Party members that was costing £100,000 to stage. The rally had all the razzmatazz of an American campaign convention with live music and celebrity backing. Kinnock flew in by helicopter, his entrance timed to coincide with the nine o’clock news. The nation watched as an ecstatic-looking Kinnock, followed by his beaming shadow cabinet, paraded through the audience to delirious applause and bounced onto the podium flushed with triumph. Whether he bellowed ‘Well, all right! Well, all right!’ or ‘We’re alright! We’re alright!’ is disputed but, whichever it was, it wasn’t so much the words as the tone that was the mistake. Kinnock sounded like a tinpot preacher. And with national flags fluttering overhead and party apparatchiks fanatically chanting ‘We will win. We will win’, the scene had altogether too many echoes of Nuremberg for the liking of the British electorate. Voters went to the polls a week later with the image of a rabid Welsh evangelist fixed firmly in their heads. It was not a pretty picture. Kinnock’s triumphalism stuck in the craw of the electorate. The Sheffield rally had turned into a public relations debacle and the Tories won the election. Toll: A disappointed Neil Kinnock resigned as Labour leader and the country had to suffer another five years of a government it detested. 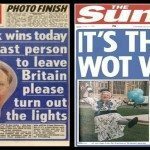 You should know: The Sun newspaper has always asserted that ‘it wos The Sun wot won’ the 1992 election. The paper ran a virulent anti-Kinnock campaign with an election day headline: ‘If Neil Kinnock wins today, will the last person to leave Britain please turn out the lights’. But the Conservatives certainly credited their unexpected victory to the misconceived Sheffield rally.